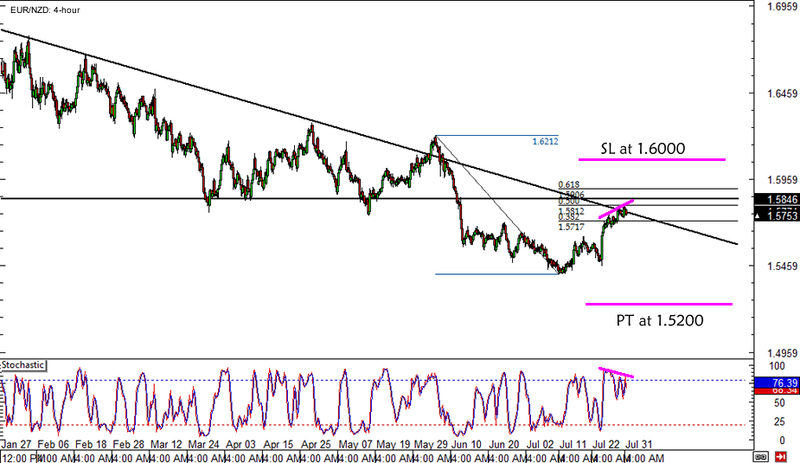 Last week, I mentioned that I was looking at EUR/NZD for a potential swing trade. Price is already moving inside my target entry area so I decided to figure out my trade details. To top it off, a bearish divergence appears to have formed, as price made higher highs while stochastic made lower highs. Could this be a sign that the selloff would resume soon? Euro zone CPI forecasts are up for release today and, while the consensus is that the headline rate might hold steady at 0.5% while the core rate could stay at 0.8%, yesterday’s Spanish flash CPI release printed much weaker than expected results and may drag the region’s forecasts lower. German retail sales, German employment change, and French consumer spending are also up for release today and I’ll be ready to short if these figures come in weak. If I’m able to short around the current 1.5750 levels, I will set a wide stop at the 1.6000 major psychological level, above the highest Fib and the falling trend line. I will be aiming for the 1.5200 mark as profit target but I’ll adjust my stop to entry once price tests the previous lows around 1.5400.